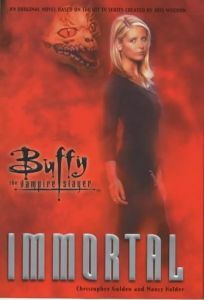 Bored by the monotonous 1940s New York City nightlife, longtime lovers and vampires Spike and Drusilla venture to war-ravaged Europe in search of Freyja's Strand, an ancient gold necklace that allows its wearer to shift forms, in Golden's (Immortal) fourth Buffy: The Vampire Slayer thriller. Acquiring the coveted artifact, however, requires doing the bidding of the comically portrayed ice demon Scrymir, who possesses the necklace yet is oblivious of the trinket's priceless powers. In order to transform the world into a realm of darkness in which he will be the ruler, Scrymir instructs Spike and Dru to kill all the Slayers-in-Waiting, a group of 20 or so girls spanning the globe who are trained to assume the role of Vampire Slayer--if and when the current slayer, Sophie Carstensen, should die. A number of suspenseful, gory battles occur as the charismatic Spike and his simpering girlfriend track each potential slayer and finally confront their greatest challenge--Sophie herself. Meanwhile, an impatient Scrymir strikes the Council of Watchers (a group of seers who train slayers) in a frightful yet banal display reminiscent of numerous cartoon battles. Although Golden's characters are only marginally developed and his details at times unnecessarily gruesome, the narrative's swift momentum and engaging action sequences make for breezy entertainment. Avid fans of the series will buy the book, of course, but word of mouth could also bring newcomers to this mysterious world of dark creatures and cruel intentions. Agent, Lori Perkins. (Oct.) Copyright 2000 Cahners Business Information.